The SHN Orpheum Theatre in San Francisco welcomes a special engagement of the �The Humans,� one of the most acclaimed American plays in recent memory. Currently playing through June 17, 2018, it features a star-studded cast that includes Richard Thomas (who created the role of John-Boy on the CBS television series �The Waltons� for which he won an Emmy Award) as Erik, Pamela Reed as Deirdre, Daisy Eagan as Brigid, Lauren Klein as Momo, Therese Plaehn as Aimee, and Luis Vega as Richard. �The Humans� is a warm-hearted play about a family reunion in which multiple generations of a clan get together for a Thanksgiving dinner. Breaking with tradition, Erik Blake (Richard Thomas) has brought his Pennsylvania family to celebrate and give thanks at his daughter�s apartment in lower Manhattan. As darkness falls outside the ramshackle pre-war duplex, and eerie things start to go bump in the night, the Blake clan�s deepest fears and greatest follies are laid bare as everybody expose�s their secrets. What happens next is what lures the audience�s interest as they air their dirty laundry at dinner, and even start fighting over dessert. But instead of erupting in bitter hatred, the characters respond to all the revelations with a form of deep love, as they become weary of battle. Our modern age of anxiety is keenly observed throughout this new American classic with humor and compassion. In visual terms, there are clues of unforeseen divisiveness in store for this lower-middle-class Irish family, which has made the long trek from Scranton for this special occasion. The setting of the family gathering is a rather depressing cement-block basement apartment with a single window that overlooks a brick-lined alley filled with cigarette butts. The lights keep going on-and-off, adding to a somewhat gloomy mood. As the head of the family, Erik Blake is a loving, yet troubled father with lots on his mind that he hopes no one will notice. His mental absences as he stares out the window at the brick alley or simply pauses as his thoughts wander, are a giveaway that something is seriously bothering him, so much so that despite his efforts his depression creeps out. Like any doting mother, Deirdre Blake (Pamela Reed) arrives with lots of food to bring to the table, but also lots of criticisms about her daughter�s lifestyle, choice of mate, present job and future plans. The main topic of concern is money, a subject that is raised again and again by every member of the family. Suffering from advanced dementia, Erik�s mother, Fiona �Momo� Blake (Lauren Klein) comes to the get-together in a wheelchair. That in itself involves a great deal of maneuvering to get her to the bathroom. But monitoring her speech is another matter, and there�s something very sad and slightly ominous about her mournful and repetitive outbursts. Each character is actually individually intriguing, and it is fascinating how each reveals their guarded secrets with such tenderness. The revelations provided of weakness in this close-knit family are not entirely unexpected � lost loves, failed jobs, depression, money troubles, health problems, unpardonable misjudgments and the overwhelming pain of grief and regret. The big question, of course, is whether the Blakes can survive after this emotional night. It obviously is not easy for them � or the audience � and the ambiguous ending appears to tilt toward the dark side. But don�t bet on it. After all, the members of this family truly love one another, and what can be a more powerful force than that? 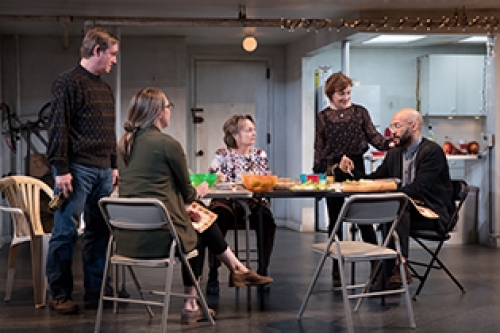 �The Humans� is the recipient of four 2016 Tony Awards including Best Play (author Stephen Karam), Best Featured Actress in a Play (Jayne Houdyshell), Best Featured Actor in a Play (Reed Birney), and Best Scenic Design of a Play David Zinn). For tickets or more information on �The Humans� please visit www.shnsf.com.